Automated time and attendance solutions are no longer only for large companies. 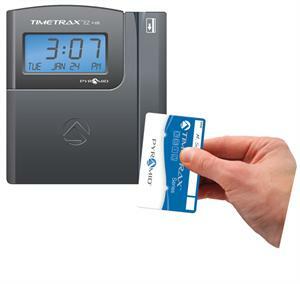 Pyramid’s TimeTrax EZ Ethernet is the first ever automated swipe card time clock system that is simple to use and will provide years of flexibility and reliability. This time clock system provides a solution that is both highly capable and works in almost every industry. Being Ethernet-ready allows for multi-terminal capabilities that will grow with your business. Simply connect the time clock unit up to any networked ethernet jack, and you’re on your way. The system accommodates 50 employees (unit comes with 50 swipe cards) and is upgradeable to 500. Dimensions: 5.7" x 5" x 2"